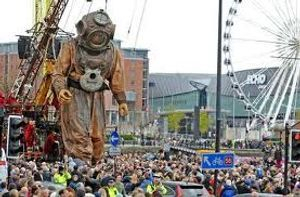 on the project for over two years with the French production company Royal de Luxe and they attracted an estimated half a million visitors. Andy McNicholl works for Liverpool and has been organising events in the City since starting with the Council in 1998. 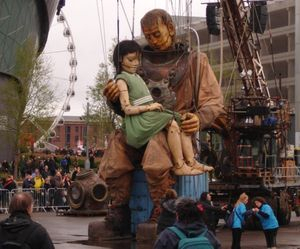 In February the technical team from Royal de Luxe were in Liverpool for their final visit to make some last checks before they all returned in April. 8:00 - We collect the French Team from the hotel to check up on the routes that we are using for the event. 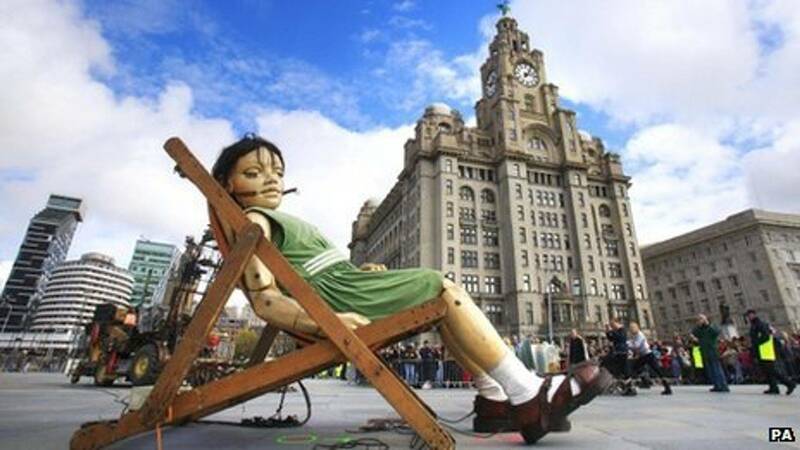 For the Sea Odyssey spectacle the giants will be walking and performing for over 23 miles across the City over the three days. All of these routes are required to be checked for their suitability. In initial visits they had to check that the roads are wide enough with them requiring a 15m by 5m gap in which to operate. As a consequence of this we have to check where there are trees with over hanging branches, over head cables, road signs, lampposts, bollards, traffic islands etc. Inevitably we have to look at removing them in order to create a passage so that the giants can fit through. We also have to check that there is sufficient weight loading for the machines that operate the marionettes and also the cranes which have to lift them. We have been lucky that we have had great support from other departments in the Council such as Highways and the City partners such as Enterprise and Glendale in carrying out this work. Check out the photographs - they are amazing!!!! A fantastic achievement Andy - I hope Liverpool appreciated everything you and the team did!!!!!!! 11:30 - We are joined on the route by some of our colleagues in Liverpool Vision who need to liaise with any businesses that are on the route. 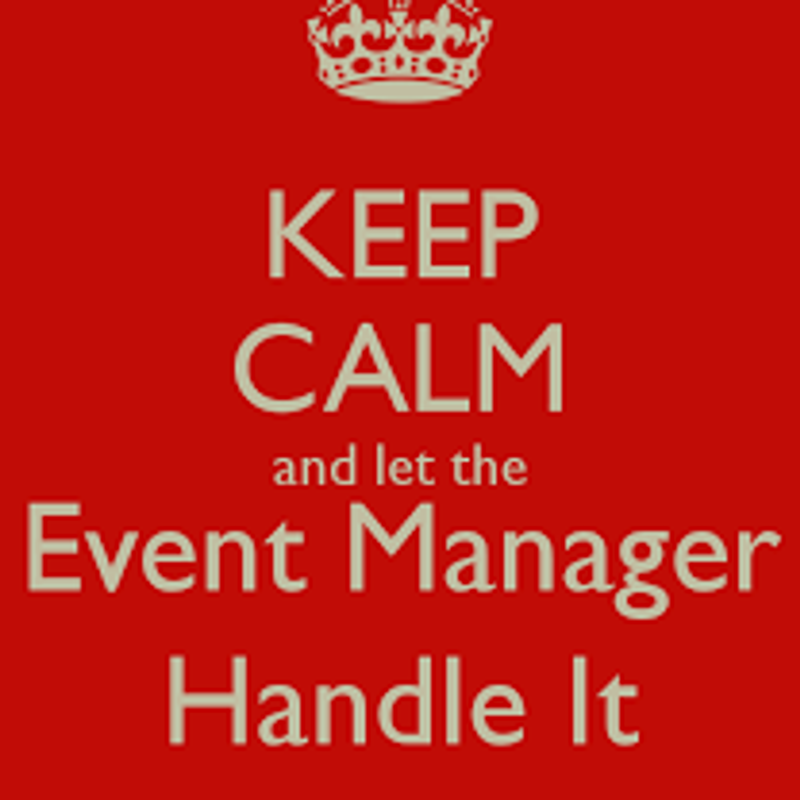 This is important from two perspectives; we need to alert some businesses so that they are geared up for hopefully a large influx of visitors and so they can maximise the opportunity. We also need to let them know about any potential disruption that the inevitable road closures could have. 2.00 - Return back to the office for a Joint Agency meeting. These meetings normally contain representatives of the Emergency Services, Mersey Travel, Licensing, Highways, Emergency Planning, City Centre Management, Liverpool One, Network Rail and various stakeholders from the Waterfront such as ACC Liverpool, British Waterways, Kings Dock Estates and Albert Dock. These meetings are an essential part of the planning process and to ensure that we are managing it in the correct way and ensuring the City runs effectively whilst the event is on. With such diverse groups these meetings can sometimes be quite difficult as they all have their own priorities and agendas. It is our role to try and satisfy as many of these as possible. For the Sea Odyssey event they have all been very supportive in the run up, with many seeing the prospective benefits for the City as a whole. 4.00 - Last meeting of the day is the most tiring! We have a sit down with the French team to go through a last check of their requirements – a 60 page document with a long list of their vehicles, equipment and staff which we need to source for the show. The ask includes ensuring that we have the right type of crane, at the right location and at the right time or it can be sourcing an ‘antique tractor’, sewing machines or twenty mattresses. It doesn’t help that some of it gets lost in translation! 6.30 - After a busy day we decide that we should show our French colleagues what else Liverpool has to offer. Convincing my wife that it’s work related is another matter . . .